A way of achieving an organization’s objectives and implementing its missions. Large scale, future oriented plans for interacting with the competitive environment to optimize achievement of organizational objectives. Pattern of an organizations responses to its environment over time. Long term objective or purpose of an organization. Execution of day to day activities with maximum returns. Strategic Management is all about the process of formulation and implementation of these strategies which are designed to achieve specific objectives. Strategic Management is necessary for effective dealing with environmental challenges within given organizational resources. 1. Selection of the corporate mission and major corporate goals. 2. 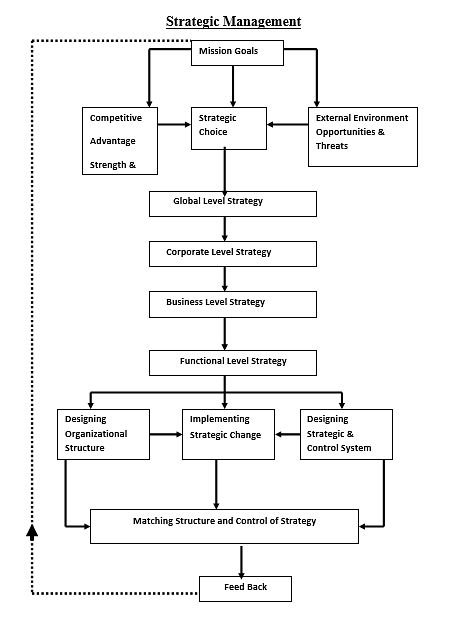 Analysis of the organization’s external competitive environment to identify opportunities and threats. 3. Analysis of the organization’s internal operating environment to identify the organization’s strengths and weaknesses. 4. The selection of strategies that build on the organization’s strengths and correct its weakness in order to take advantages of external opportunities and counter external threats. 1. Corporate Level Strategy: - Composed principally of members of board of directors and chief executive and administrative officers. They are responsible for financial performance of corporation as a whole. Orientations at the corporate level reflect the concern of all stakeholders. 2. Business Level: - Composed principally of business and corporate managers. These managers must translate the general statements of direction and intent generated at the corporate level into concrete, functional objectives and strategies for strategic business units. 3. Functional Level Strategy: - Composed principally of manager of product, geographic and functional areas. They are generally short term strategies. The task of analyzing the organization’s external and internal environment and then selecting an appropriate strategy is normally referred to as strategy formulation. In contrast strategy implementation involves designing appropriate organizational structure and control systems to put the organization’s chosen strategy into action. Strategy implementation has four main components. Matching the strategy, structure and controls. Managing Conflict, Politics and change. Designing a structure entails allocating task responsibility and decision making authority with in an organization, how to divide the organization into sub-units, how to distribute authority among the different levels of an organization’s hierarchy and how to achieve integration between sub-units, all these are part of designing the Organizational structure. Through Control Systems Organization decides the best way to assess its performance and control the actions of various sub-units. If it wants to succeed, a company must achieve a fit among its strategy, structure and control. 4. Managing Conflict, Politics, and Change. Although in theory, strategic management process is all rational decision making process but in practice, organizational politics plays a key role. Departments may compete with each other for a bigger share of an organization’s finite resources. In the Strategic Management Process chart the feed back loop indicates that strategic management is an on-going process. 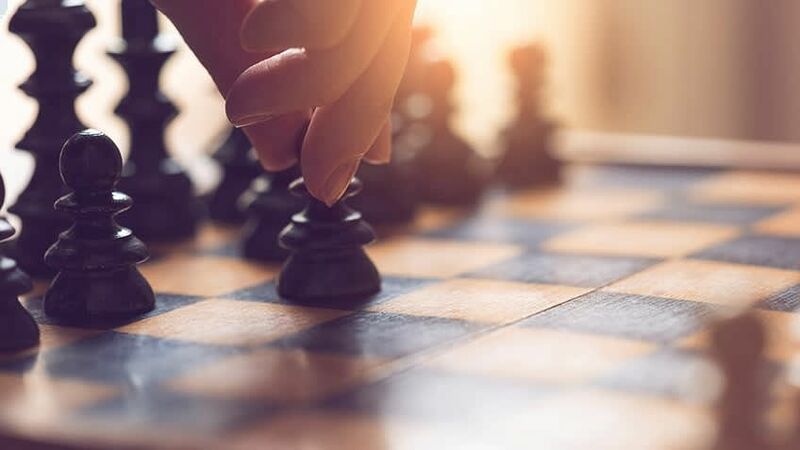 Once a strategy is implemented, its execution must be monitored to determine the extent to which strategic objectives are actually being achieved. 1. Strategic Management enhances the problem prevention capabilities of the firm. 2. Group based strategic decisions reflect the best available alternatives. 3. Employee motivation improves as they appreciate the productivity reward relationship inherent is every strategic plan. 4. Gap and overlaps in activities among diverse individuals and groups are reduced. 5. Resistance to change is reduced. By Pearce and Robinson , Irwin/McGraw-Hill. Manish is a PMP certified professional with more than 7 years of IT industry experience in various technical and cross functional roles. He holds an M.B.A (International Business and Finance) and B.E. (Hon’s in Electronics and Communication Engineering) degrees.